"For those who make a commitment to take on the challenging emotional and mental healing required, the life that emerges, in addition to being cancer-free and healthier, can be miraculously free and joyful. " I’ll never forget the first time that a long-term cancer survivor told me that her diagnosis of cancer was, in retrospect, one of the best things that had ever happened to her. Needless to say, I was intrigued and began to question her to find out what this statement was about. After the third time I heard the same sentiment expressed by a cancer survivor, I began to see a pattern and common message emerging: Cancer is a wake-up call to identify, heal and transform what is out of balance in our lives. 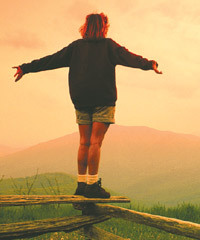 Survivors understand that the resulting changes and life-in-balance that emerges can be vastly improved on what existed before. When there is nothing left to lose, the courage to address negative emotions and subconscious patterns of self-sabotage becomes easier to access. Sometimes we allow ourselves to carry on for so long with unexpressed anger, resentments, unresolved grief over losses and other negative emotions and mental attitudes, that it takes the body’s development of cancer to jolt us into the awareness that we must make changes and deal with these issues. Finding out that you have cancer puts the need to “get right” with your life directly in your face. For those who make a commitment to take on the challenging emotional and mental healing required, the life that emerges, in addition to being cancer-free and healthier, can be miraculously free and joyful. Emotional release work is probably the most dreaded, denied and avoided part of any healing protocol. Our egos will convince us that we’re ok, that we’ve either dealt with this area of our lives, or that any problems that exist are due to someone else’s actions or attitudes. One of the most powerful types of emotional release work is forgiveness. If you're thinking that maybe the other person really doesn't deserve your forgiveness--well, perhaps you're right. But forgiveness isn't for the other person--it's for you! When you sincerely forgive, you're no longer burdened with the energy-draining (and immune weakening) effects of anger or resentment. And those obsessive thoughts about revenge no longer invade and deplete your peace of mind and hope for the future. There's an ancient Chinese proverb that suggests that he who picks up a hot coal to fling at his enemy in anger is the one who ultimately gets burned. Think about that. Forgiveness is the way for you to ultimately be in control--rather than having your angry feelings and simmering resentments running your life. For a profound and important chapter about this aspect of healing, be sure to read Greg Anderson's story on this website. Because of the stories I heard from the hundreds of cancer patients and cancer survivors in my years at NFAM, as well as personal research and experiences, I have come to understand that mental, emotional and spiritual healing must be the foundation and keystone of any successful healing protocol. Without this vital work, the rest of the treatments undertaken, no matter how advanced, innovative and effective, are built on a foundation of ‘quicksand’ and although successful in the short term, will probably not produce a long term cure. And remember--many respected healers believe that once a patient makes the decision to embrace his or her healing journey and the commitment to discover and address whatever thoughts and emotions might block that path, the healing process begins in that moment. There is an energy field of divine support and grace created through intention and allowing that is a powerful and very real part of any treatments chosen. All it takes is the choice--and the decision-- to begin. Choose now. It's never too late.